Wait, did that ad really suggest that black men should “re-civilize” themselves? A racist Nivea ad that appeared in the September issue of Esquire. In recent days, we’ve enjoyed hearing, reading and writing about many of the incredibly dumb statements made of late by some people who claim to be Presidential candidates. In wandering around online news outlets, we came across a shocking ad from the Germany based skin-care folks at Nivea. The ad is quite simply, too dumb to be believed. In fact, the ad is actually quite racist. The advertisement, which reportedly only appeared once in the September issue of Esquire, shows a well dressed, well-groomed African-American man throwing away the decapitated head of unshaven black-man with full beard and Afro. Esquire did publish a similar ad that showed a white man tossing away hairless head. One can’t help but wonder about the different texts: Who could be so dumb? Who could so racist -in a major ad agency yet? In the marketing department of Nivea? How did the folks at Esquire let this ad get published? 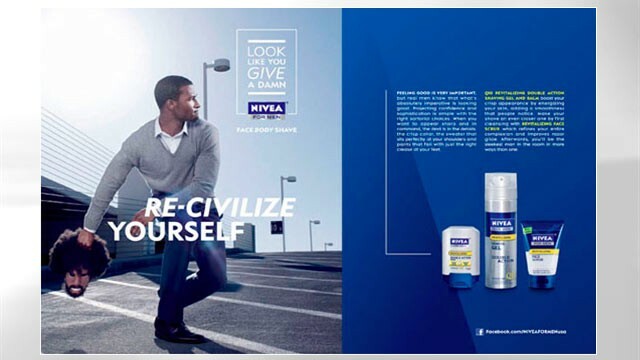 We appreciate all of your comments and feedback regarding the recent “Re-civilized” NIVEA FOR MEN ad. Our company values diversity and equal opportunity, and it was never our intent to offend anyone. We have ceased placing the ad in media everywhere. We don’t know if they will actually be thrown, but undoubtedly, some heads will roll for this.